Concept art by Patrick Tatopoulos. With this basic outline, the mutated researchers were conceived with a vaguely humanoid outline, implying their origin. Tatopoulos himself tends to infuse his creature designs with humanoid traits. “the [scariest] creatures I’ve seen, ever, are creatures with… a bit of humanity to them,” he said in a featurette. “Look at Alien, look at Predator. Those are iconic creatures. There’s a bit of an anthropomorphic shape to them, they look ferally human. Those are the most fascinating creatures.” The Monsters, in fact, retain humanoid shoulders and arms, as well as vestigial molars in their internal jaws. Tatopoulos further elaborated in an awn.com interview: “we imagined that it would direct itself via echolocation, just like the bats and their sonar system. To this purpose, I conceived a skull whose shape was designed to gather a maximum of sounds. The head also included a specific organ to generate the sounds that allowed for echolocation.” The parietal and frontal skull bones of the skull developed a hollow space; while still maintaining their function of protecting the brain, they also act as a resonance box — enabling the propagation of the acoustic impulses emitted by the sonar organ. 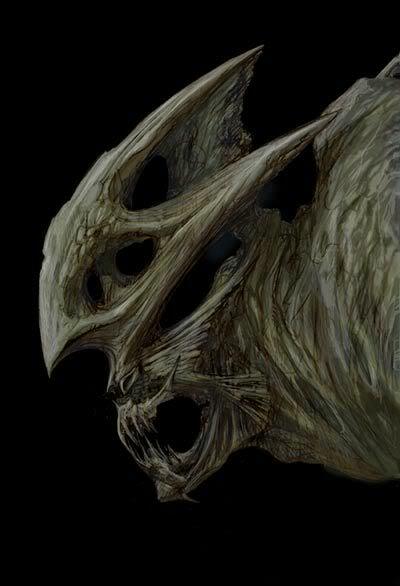 Each individual creature also has a different cowl design, ranging from a smooth, hollow dome to a crest with three horns. 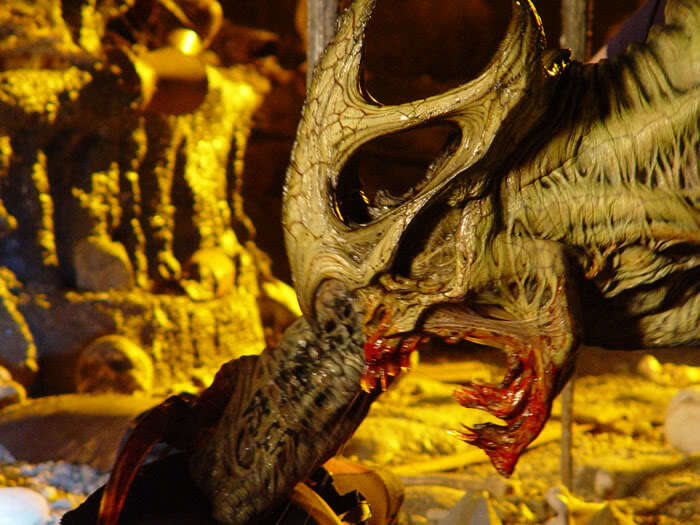 At least three different configurations were featured in the final film, with the horned design assigned to the ‘leader’ creature. A key element of the design was the inclusion of wings, something Hunt was adamant about. “Wings are not an obvious choice,” Tatopoulos said, “when you live in a cave, in a small corner. I don’t see why you would have wings down there; if you need to escape you don’t need wings. But the fact that Bruce told me, ‘I want gigantic caves,’ then it started to make sense.” He also addressed the issue of having to move with wings in an environment like an underground tunnel. He told SFX magazine: “at the same time, I designed the wings so that they could fold entirely along the body to avoid hampering the upper limbs’ movement in narrow spaces.” The mutation privileged the arms, whereas the legs were reduced to simple supporting appendages, with the bulk of the movement performed by the arms themselves — which became hypertrophied. The Monsters display other peculiar features: they have both external and internal jaws, which are able to move independently from each other. In addition, the external jaws’ teeth are limitedly articulated, and can flare in and out in order to achieve a better grip on a prey; this last trait was given in order to give “more life” to the characters. Sensory whisks sprout from the Monsters’ back, aiding them in identifying their location. 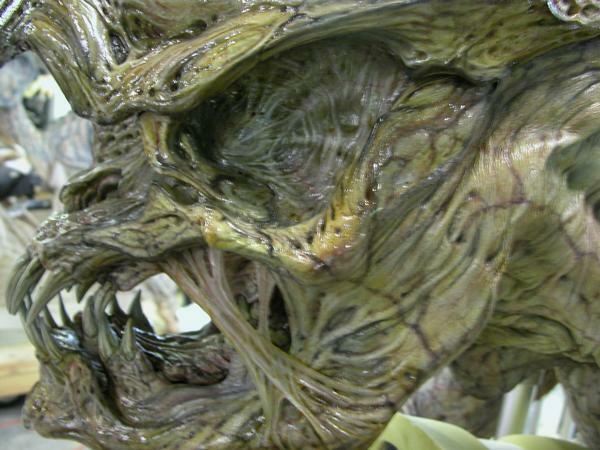 Lead sculptor and painter, as well as art director Steve Wang also conceived the design’s vestigial eyes, covered by a semi-transparent layer of skin membrane. Hunt also dictated that the creatures should have certain parts of their surface covered in a protective exoskeleton. Since the Monsters are — by all intents and purposes — human in origin, Hunt wanted to infuse the Monsters with character, and gave them a “taunting” behaviour and attitude, as well as a considerable level of intelligence and tactical knowledge. 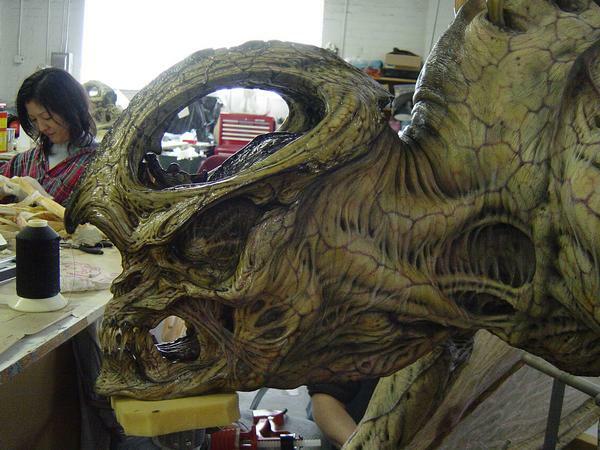 One of the finished creature heads. 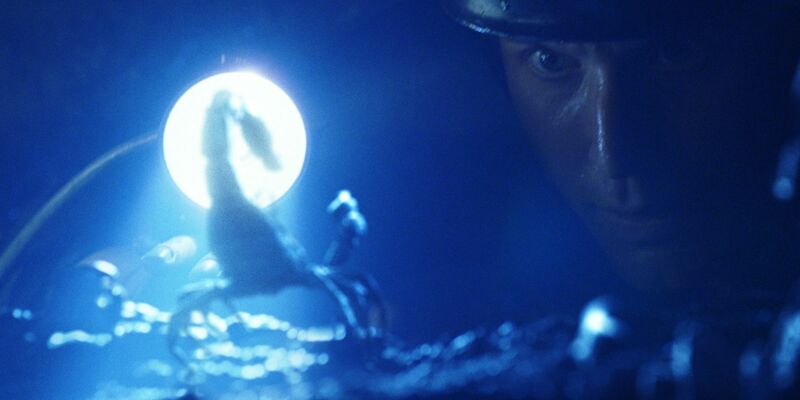 The creatures of the cave were brought to the screen as performers in suits and digital models. 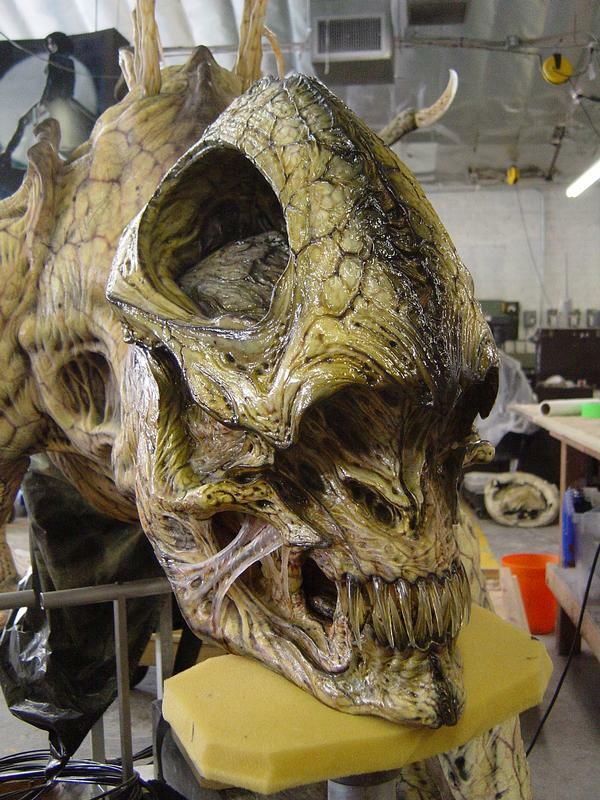 The creatures were sculpted by Steve Wang, Tully Summers and other sculptors. It was established since the beginning to use performers in suits as the main technique of creature effects. 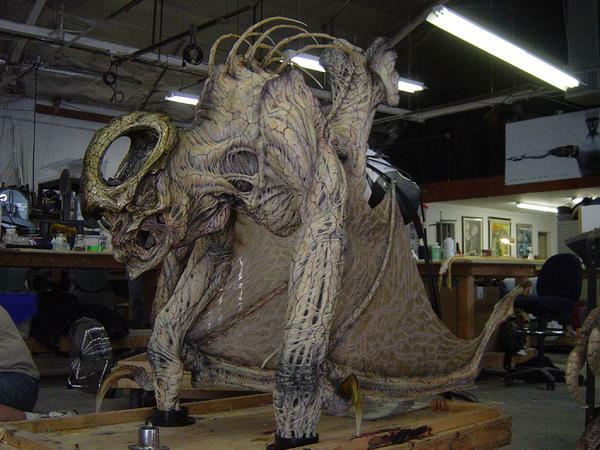 This decision influenced the design of the Monsters themselves; “that was the only real bound that we gave ourselves,” Himber said, “was, you know, we have to work with this human form, we want to hide it in an effective way — and from that, the design was up for grabs.”A picture of performer Brian Steele in a crouching position was, in fact, used to draw a silhouette of the creature design over the photograph, in order to establish actual proportions and length of the arm extensions. Structurally, the suit only covered the head, arms and torso of the performer. 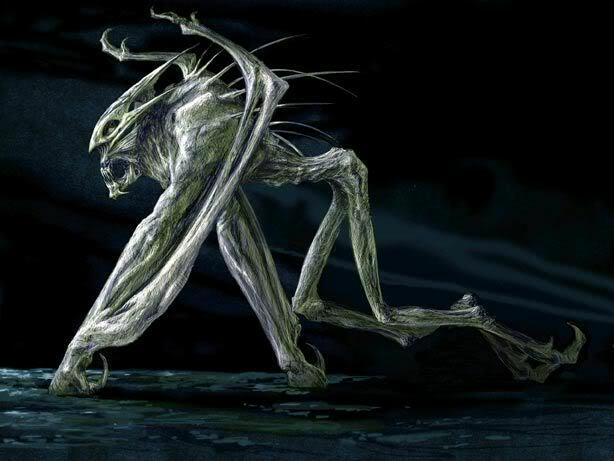 His lower body and legs — in front of the actual Monster’s lower body and legs — were covered either in black or in greenscreen fabric. 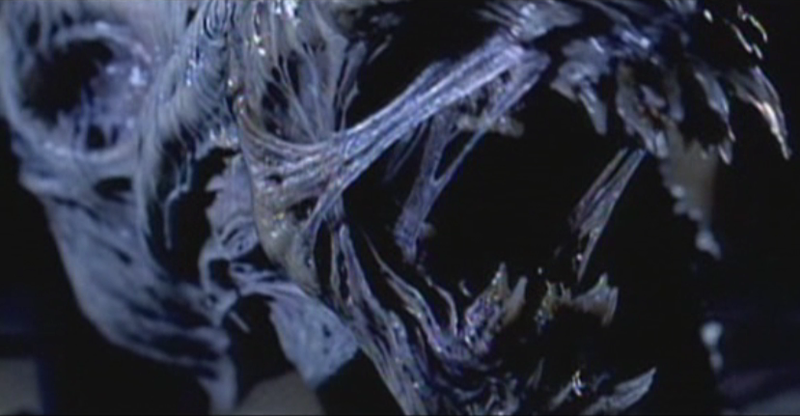 As such, the legs could either blend in with the dark environment or be digitally removed in post-production. Detail of one of the heads, showing the vestigial eyes and semi-transparent eye cover membranes. The skin of the suits was moulded in foam latex, with the semi-transparent eye covers and jaw tendons molded in cleartex. The outer teeth were moulded in resin, whereas the inner teeth were cast in solid resin. All the suits could also be fitted with two versions of the wings – an opened pair, and a closed pair. “You should know,” Tatopoulos said, “that a fluttering motion is a very complex movement to reproduce at a mechanical level. I have never seen in any film animatronic wings that were totally convincing.” A featureless dummy portraying a dead creature and a skeleton were also built. 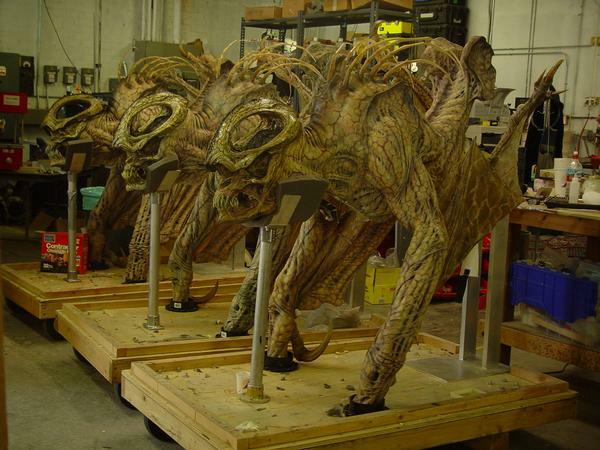 The Monsters were modeled and animated in Maya, using a maquette and reference photos provided by Tatopoulos Studios. Further surface detail was added with zBrush. “This was the first film in which we had a heavy reliance on a ZBrush pipeline,” Shohadai explained. “It took us a while to iron out the degree to which we would rely on it. We imported the Maya mesh into ZBrush and, at higher subdivision levels, we painted all the fine details, including the stringy, sinewy veins that cover the outside of the creature skin. There were so many of these that it almost looked like noodles covering the skin. We created the colour map separately and used displacement maps to generate the vein map and the higher resolution details. 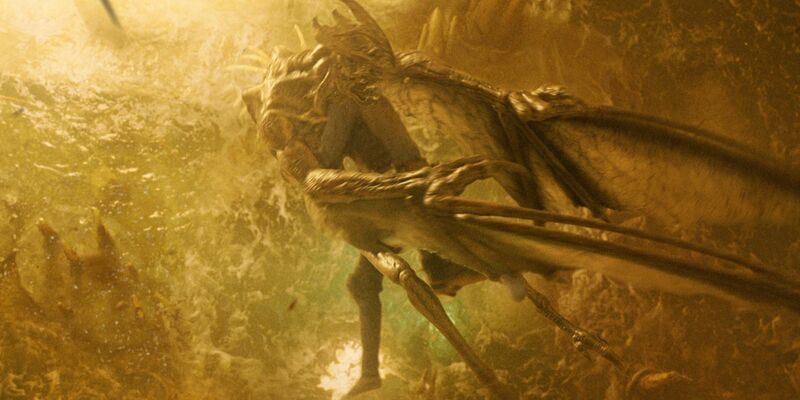 As a result, the creature ended up having much more detail than CG creatures typically can [have] in films. Most importantly, this highly-detailed CG creature was still perfectly usable in production, which is not always the case with high resolution models.” Artists at Luma Pictures animated the characters with a lot of creative freedom, and based their movements on several animal species — including bats, lizards, spiders, and crabs. 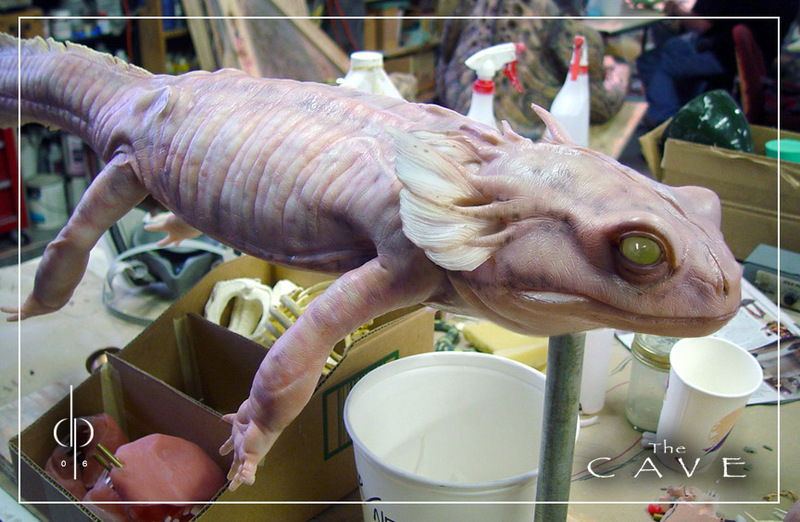 The salamander, one of the minor creature characters from the film. 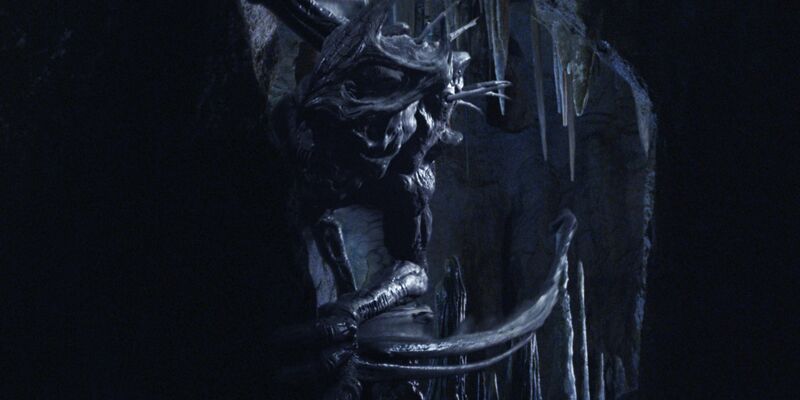 The mutated humans are not the only Monsters featured in the film; every example of fauna in the cave system has been infected by the parasite organism, and some mutated animals are shown in specific scenes. Digital scorpions were created by Luma Pictures. 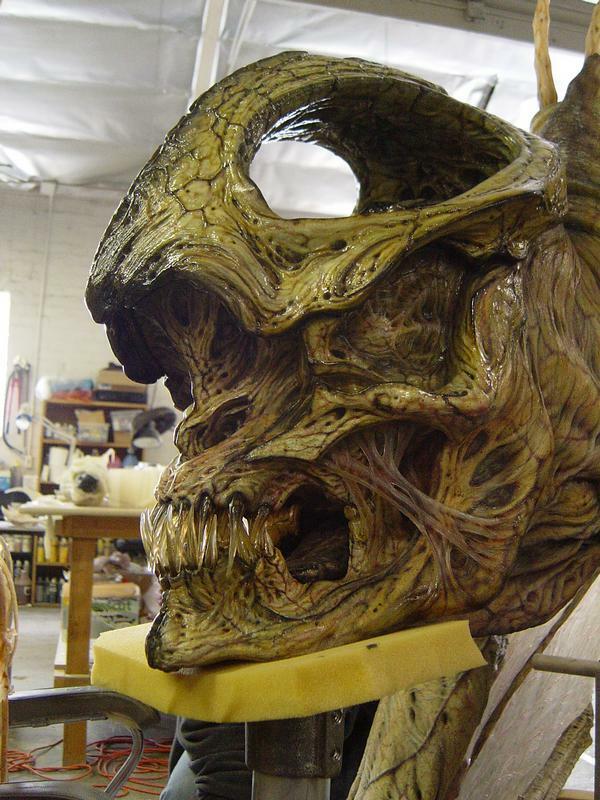 Tatopoulos Studios also brought to the screen a mutant mole, a mutant salamander and mutant eels, all sculpted by Dan Platt. The mole was a simple dummy with rough mechanisms animating the head. 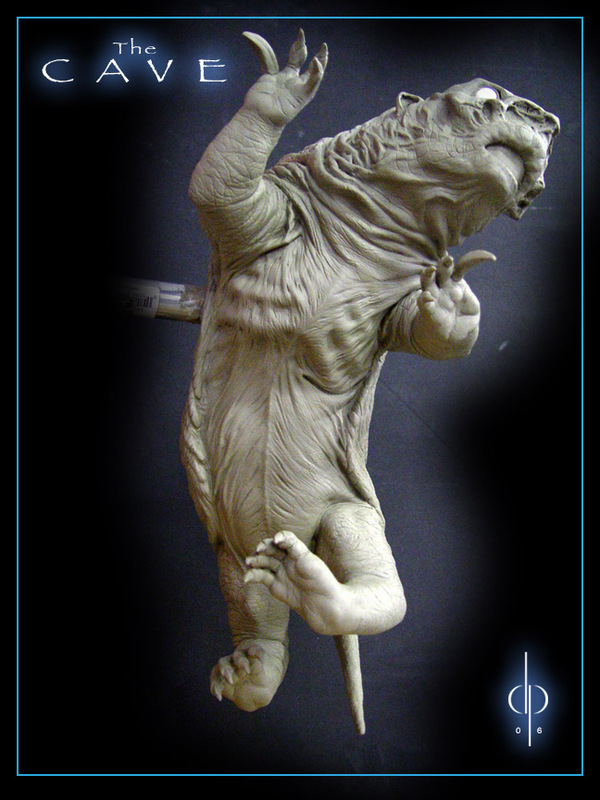 The salamander was a flexible rod puppet. Two rods were attached to it and moved alternately — creating an organic crawling and swimming motion. The eels were created as a rod puppet with mouth-opening mechanisms, and wire-controlled puppets able to ‘swim’ in water. One of the digital scorpions. 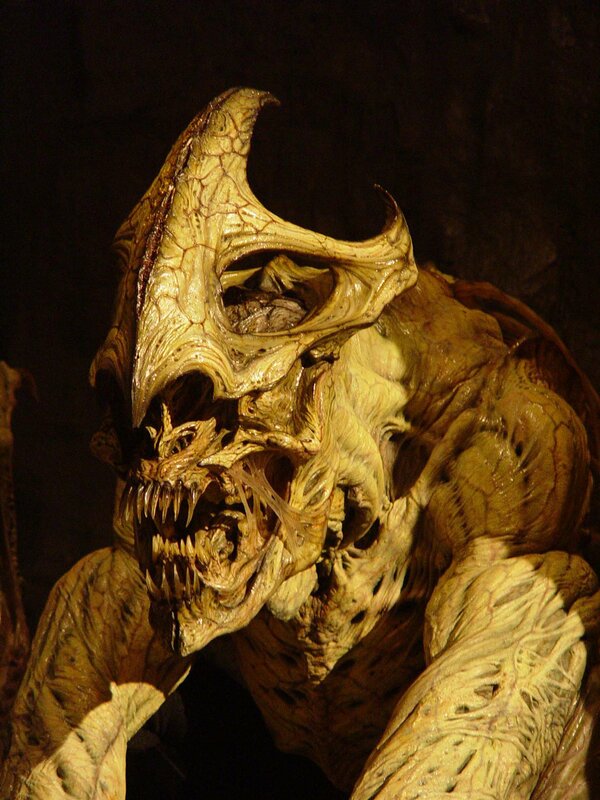 For more images of the Creatures of the Cave, visit the Monster Gallery. Posted on 30/10/2013, in Movie Monsters and tagged Brian Steele, Patrick Tatopoulos, Steve Wang, The Cave. Bookmark the permalink. Leave a comment.